Most PC gamers game with a keyboard and mouse at some point, or exclusively. This keyboard/mouse form factor usually limits you to a desk, whereas controllers give you the freedom to game from the couch. COUCHMASTER offers a solution to this, to allow you to game with a keyboard and mouse from your couch and promises comfort. Let’s take a look! I am a bit of an old curmudgeon in a lot of ways, and gaming is no exception. My favorite game genre is FPS, and fast paced at that. I can not play first person shooters with a controller; it’s just not going to happen. I must have my keyboard and mouse, which also means I am more or less tethered to my desk. In recent years, we have seen a few companies come forward with similar solutions to this. The basic premise is the same, but the details are of course what set them apart. Some have a bean-bag type lap cushion, so you just rest the platform on your thighs, others like this COUCHMASTER Cycon from nerdytec are more modular, with a separate lapboard and armrest pillows. There are octagon passthrough holes on both sides at the top, making this suitable for both left and right-handed users. Also located at the top near the middle, we find a single USB 3.0 port. 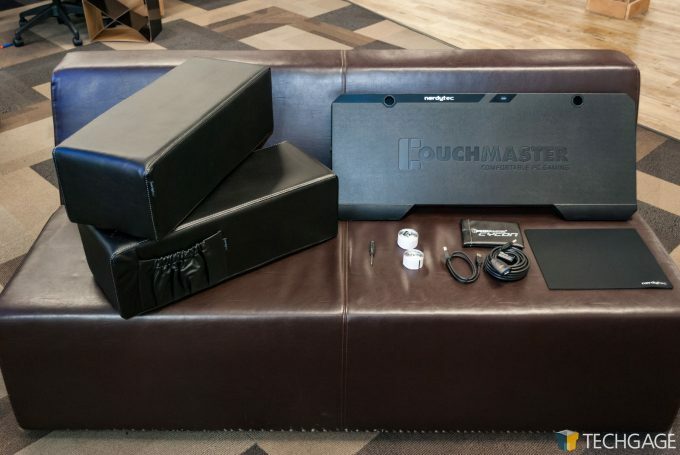 The COUCHMASTER Cycon comes with a small screwdriver, short and long USB cables, a mouse pouch, velcro strips, and a mousepad. 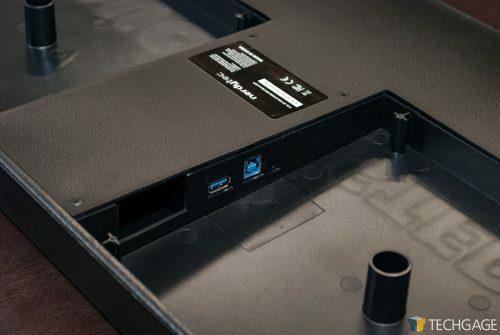 Once we pop the covers off the bottom side of the plank, we find two USB 3.0 ports on one side, and two more USB 3.0 ports, one of which being your uplink using the standard uplink form factor which is Type B. Next to the Type B we do find a barrel connector, for which you can add a power supply if you choose. The folks over at nerdytec say that you don’t need it as USB 3.0 supplies 900mA of current, and if you are just using a keyboard and mouse, you can probably get away without using one just fine. If you want to utilize that top port for charging your phone or something like that, then you may want to consider adding a power supply. Also inside the plank, we see routing pegs, which you can see here, I used to route the cables neatly for my keyboard and mouse. You don’t have to use these of course, you can always just stuff the cables inside the cavity. The people at nerdytec state that this is a one-size-fits-all, or “fits every body size” solution to comfortable couch gaming. I didn’t exactly find this to be the case… technically. It did fit me, but I found myself worrying that I was going to dump over the plank if I wasn’t careful. To be fair, I am a pretty big guy, being over 6’1″ tall, and uh… big-boned… I certainly don’t represent the average body size for a human. 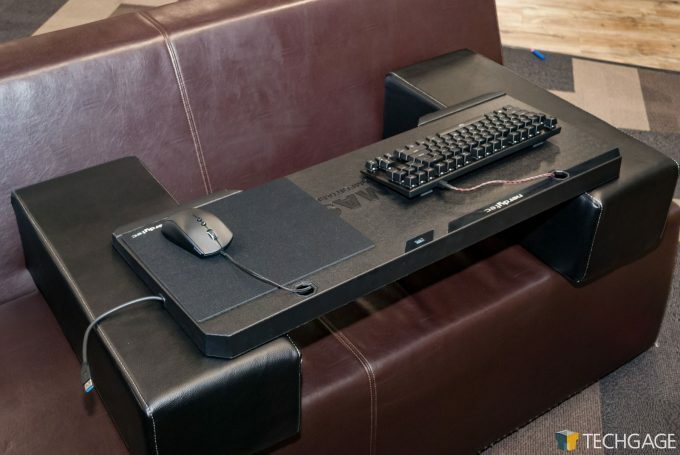 To be fair again, I was using this at my office on our gaming rig, and our couch is pretty firm, so it doesn’t have much give when you sit in it. I imagine if I were at home and sat in my couch, I would sink down in more, and be much more comfortable with this. The advantage to the COUCHMASTER Cycon over other models is the modularity. I found that I actually preferred nixing the pillows and just setting the plank directly on my lap, where I had some co-workers that preferred the pillows. Thanks to the modular design of the Cycon, you can do either! In testing, I found that where it is nice to have the cable routing pegs inside the plank, I actually prefer to not use them at all, or to only wrap maybe one or two turns of the cords around them, and just stuff in the rest of the loose cable. Now I know this sounds sloppy, but I found that there were times where I wanted a little more cord to be pulled out for this reason or that, and being bound by the cables being held in more or less captive by the routing around the pegs was a little annoying. I am a little crazy about these things however, and normal people likely wouldn’t have any issue with this. 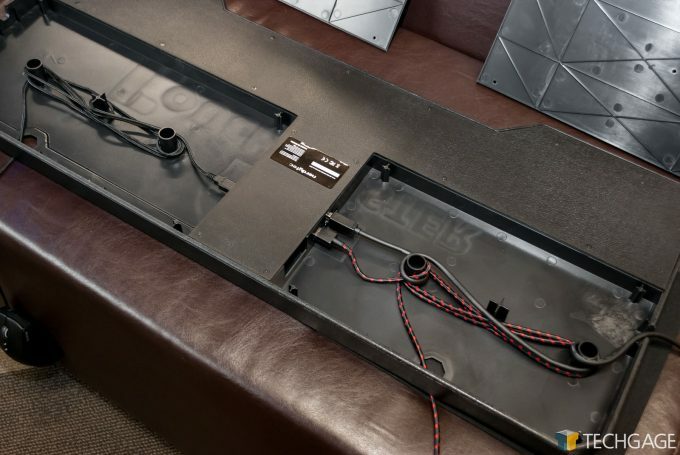 The cables that are included seem to be of premium quality, and the uplink cable to connect the COUCHMASTER Cycon to your rig is a generous 5 meters long, or just over 16 feet for those of us that can’t seem to get to the metric system. 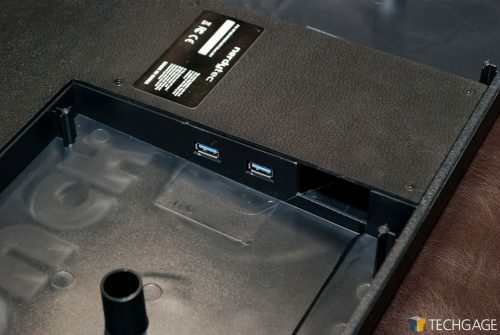 As I mentioned before, you don’t need a USB power supply to use this, and with just a keyboard and monitor you certainly don’t, but it was a really nice future-proofing move for nerdytec to include one in the design. Overall, the fit and finish seems to be top-notch, well thought out, and very well made. If you are looking to add some comfort and function to your gaming, I would certainly give this a hard look. 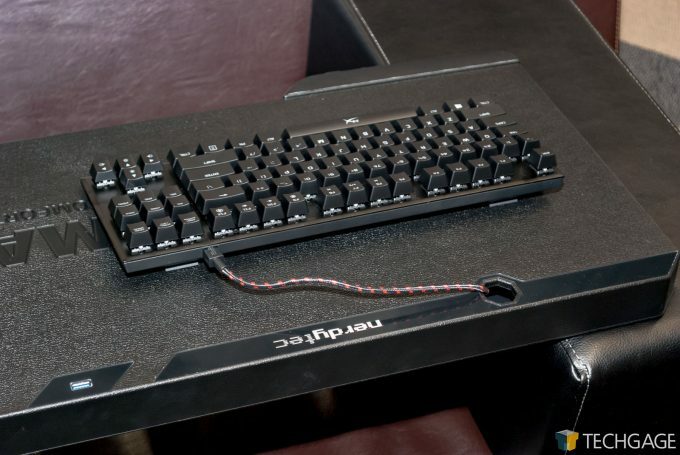 At $149, it’s at the upper end of the spectrum as far as bringing gaming functionality away from your desk, but the features that the COUCHMASTER Cycon offers make it worthy of the asking price, I believe.